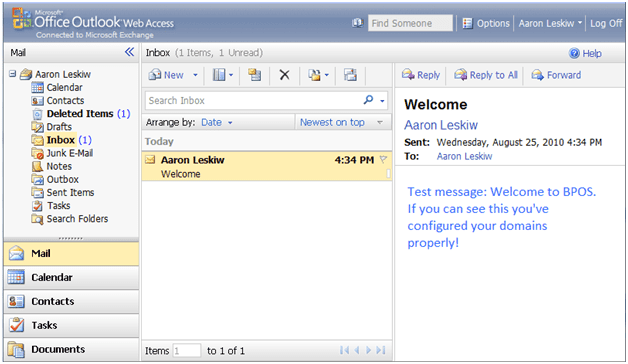 One of the first tasks for many admins switching to the Microsoft Business Productivity Online Services (BPOS) is to configure email messaging. This can be accomplished a few different ways, depending on your migration strategy. 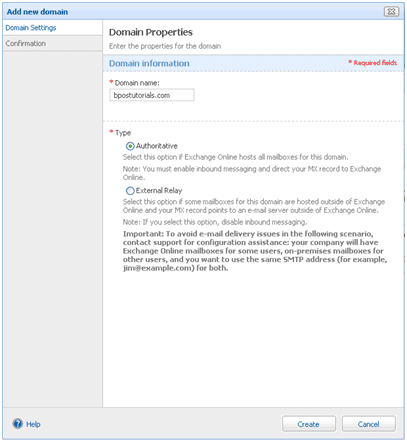 In this article we’ll walk through the simplest way of getting BPOS up-and-running: configuring BPOS as primary mail server for a domain without any data migration; and no Exchange co-existence. You are setting up a brand new domain with BPOS. You are running a trial evaluation of BPOS with a test domain before committing and migrating users. You’re switching to BPOS from another hosting provider, and have no (or little) mailbox data to migrate. You want to switch to BPOS, but only have a small number of mailboxes, so creating new mailboxes is low-effort. Setting up BPOS as your primary mail server is very easy. There are only a few tasks involved, and we’ll walk through them step by step. First, a couple of prerequisites. If you haven’t already, sign up for a BPOS trial or pay account. I’m going to assume you can handle this one on your own. Second, log in to the BPOS Admin site with the Administrator ID you just created. The link will be in the welcome email from Microsoft. Add your custom domain(s) to BPOS. Microsoft creates a generic domain that you could use for messaging, but it’s pretty ugly. Something like “[email protected]”. In this example we’ll add a new domain called bpostutorials.com. Verify your domain – a procedure to confirm that you own the domain you’re attempting to add to BPOS. 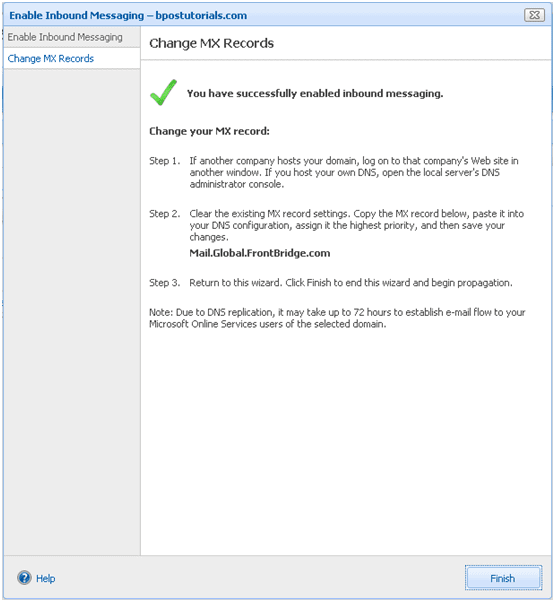 This step involves creating a DNS record with your DNS host or domain registrar. Create user accounts and mailboxes in BPOS. 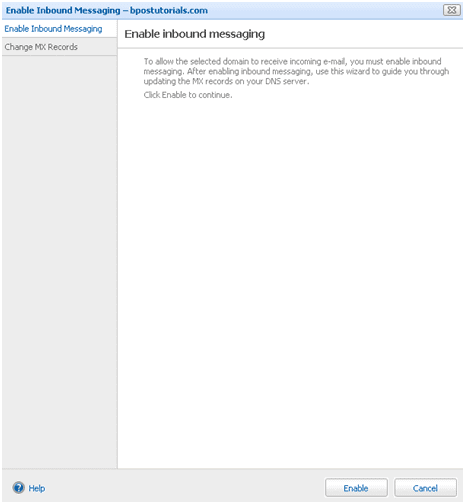 Enable inbound messaging so that internet hosts send mail to BPOS instead of your old servers. This involves changing your DNS MX (Mail-Exchanger record) to point to Microsoft. Open up the BPOS Admin site. You may have a helpful “Tasks I Need to Do” shortcut in the middle of your screen. If so, click “Add your domain to Microsoft Online Services”. If not, click on the Users tab, then the Domain menu item. If you’re using the Users/Domains tab, click the “New” link in the upper-right corner. A screen will pop-up, like the one below. Enter your Domain name in the box provided – in my example I’ve used bpostutorials.com. The two options in the lower-half of the screen determine if BPOS will be the primary mail server, or if it will co-exist with an external Exchange system. Since we want BPOS to be your primary mail server, choose the “Authoritative” option. Click “Create” and a window like the one below will be displayed. 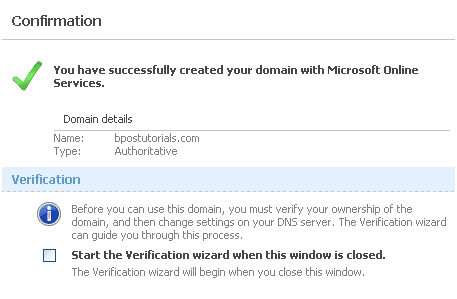 Select the box to “Start the Verification Wizard” if you’re ready to go to the next step and Verify the domain now. 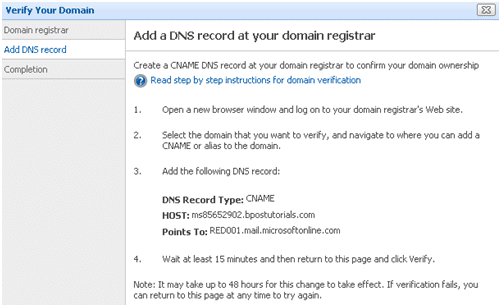 Verifying a domain is accomplished by creating a DNS entry called a CNAME, or Alias into your DNS records. Your DNS records are generally hosted by your domain registrar, though in some cases your DNS may be hosted elsewhere. First we need Microsoft to tell us how to configure the CNAME. If you didn’t select the option to start the Verification wizard in the previous step, then go back to the Users tab, and click on the Domains menu item. The newly added domain will now appear in the domains list. Click the “Verify Now” link. Select your registrar from the drop-down if available, otherwise select “Other” and click “Next“. On the next screen you’ll be provided with DNS settings that you’ll need to configure with your domain registrar. Don’t use the ones in the screenshot here, they will all be unique. Make a note of the Host name, and “Points To” information. Keep this window open. Now, fire up a new browser window and log in to your domain registrar’s admin site. The example below was created using Go Daddy, but most registrars will have a similar tool. Microsoft has also compiled a detailed list of instructions for popular registrars. Open up your registrar’s DNS tool and add a CNAME record. For example, with Go Daddy I would click the “Add New CNAME Record” button on the right-hand side of the screen. Enter the Alias information that BPOS gave you. Note that you usually don’t have to fully qualify an Alias (i.e. the full domain name isn’t required, just the host name). Success! Keep your registrar’s admin site open, because you’ll need it again in a minute. Flip back to your BPOS window (you left that open right?) and click the “Verify” button. If you did it right, then you should see a message like the one below. If it was unsuccessful then go back and confirm that you typed in the alias properly. Some registrars may take a few moments to process the change, so you could also try doing a DNS lookup from another system to confirm that the alias is working. BPOS won’t verify the domain until it can resolve the new alias you created to the server name it provided you in the previous steps. Without going into detail, this would be a good time to create some user mailboxes. In a moment you’ll tell the world to start sending mail to the new BPOS server for your domain. If you haven’t configured accounts before making the next changes, then mail delivery could be refused. Make sure to select the correct domain from the domain drop-down box when creating users! Tip – make the domain you just created your “Default user account domain” on the domain properties screen. This will add new users to this domain by default. This is it, the big moment when you enable messaging with BPOS. Before you proceed, make sure that you’re ready to make this change. This will make BPOS the primary, and only, mail server for your domain. Make sure you’ve created mailboxes, notified your users how to access the new system, and that you’re sure you want to direct all incoming mail to BPOS. 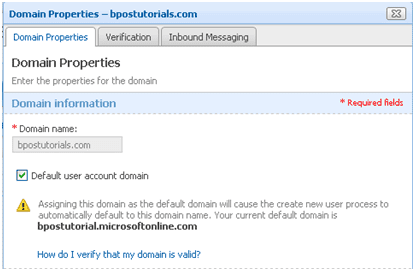 Click on the name of the domain to access the domain properties box, then go to the “Inbound Messaging” tab. Click “Enable”. And you’ll see a Success window like this one. But you’re not done yet! 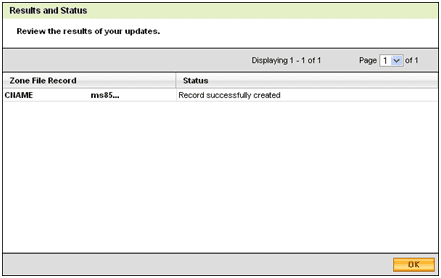 The dialogue box will provide a new MX record that needs to be set-up with your domain registrar. Make a note of the new MX information (e.g. in “Step 2” in the window below). Check to make sure that no other MX records have a higher priority. If they do, change them to a lower priority (e.g. 10 or 20. Larger numbers = lower priority), or delete them if appropriate. The new record needs to be the highest priority or mail delivery will not work. Done? Great! 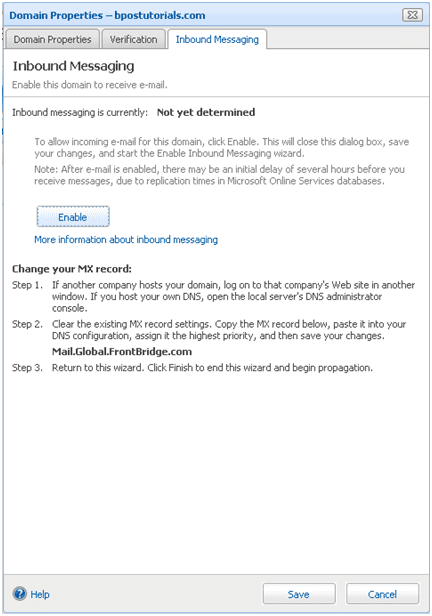 Switch back to your BPOS admin window, and click Finish on the Enable Inbound Messaging box. That’s it! You’ve just configured BPOS for email. As you can see, configuring BPOS is very easy to do. But, what if you want to migrate Exchange mailboxes over to BPOS, or perhaps run BPOS for only a sub-set of your users? In a future article we’ll cover solutions to those problems, including Exchange co-existence and Active-Directory synchronization. 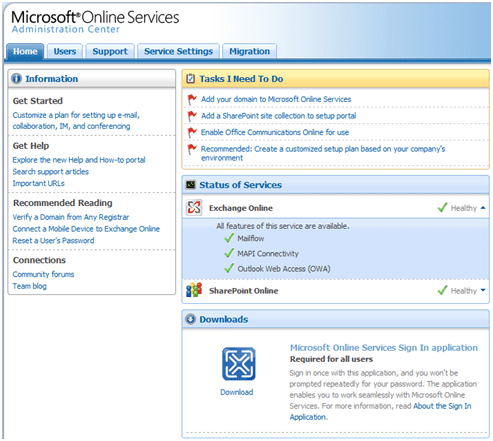 Be sure to catch our overview of hosted exchange with Microsoft BPOS.